2019 Investec Super Rugby Draw announced! The Investec Super Rugby 2019 Draw has today been confirmed, with the Gallagher Chiefs kicking off at home in the opening match of the competition in a gripping New Zealand derby, on Friday the 15th of February against southern foes the Highlanders. The Gallagher Chiefs will again face all the New Zealand teams home and away with home derbies to be played against the Hurricanes in Round 5, Blues in Round 9, and the Crusaders in Round 16 for a fiery last round robin home game of the season. We are excited to welcome the Sunwolves back to Chiefs Country in Round 3 and also host the Lions, Sharks and Reds. It will be the first time facing off at home against these tough South African opposition since 2016. A tough and intriguing international tour beckons where the team will face the Bulls in South Africa, before travelling to Argentina to take on the Jaguares. The Investec Super Rugby competition structure will run uninterrupted for 21 weeks as there is no June inbound international matches in 2019 due to the World Cup in Japan. That will make for an action packed Round Robin series for fans to enjoy with the playoffs beginning on the 22 June, with the final to be played on Saturday 6 July. 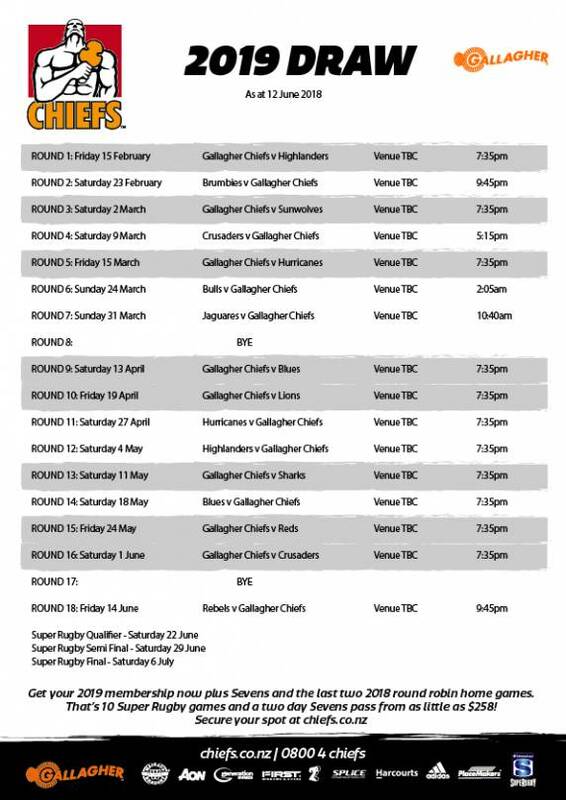 The Chiefs Rugby Club are currently working on securing the eight home game venues and will let fans know these as soon as they are confirmed. Get ahead of the game with a great membership offer for 2019 – all the best Investec Super Rugby in Chiefs Country plus the Sevens and a bonus of the last two round robin home games of the 2018 season at FMG Stadium Waikato facing the Brumbies and the Hurricanes. Visit chiefs.co.nz for more information.